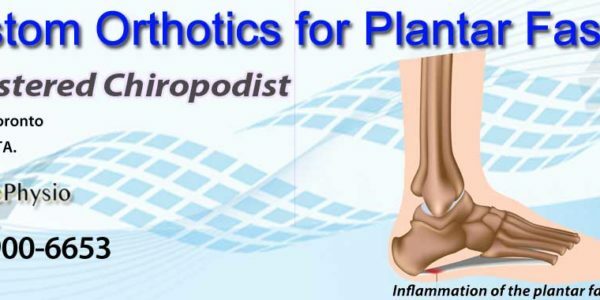 Plantar fasciitis is one of the most common foot conditions treated by Physiotherapists and Chiropodists. It is estimated that up to 10% of the population (1 in every 10 people) will experience plantar fasciitis during their lifetime. Plantar fasciitis makes up 40% of all foot complaints. If you are suffering from your heel pain, custom foot orthotics can be helpful in treating your problem. On the base of your foot, there is a thick flat fibrous tendon-like tissue structure that connects the bottom of your heel bone to the base of your toes called the “plantar fascia”. This tissue structure forms the arch of your foot and prevents over flattening of the arch. When some micro tears appear in plantar fascia, it may be inflamed and develop some symptoms such as pain that are referred to as plantar fasciitis or plantar heel pain. The characteristic symptoms of this condition include foot arch or heel pain after resting and arch fatigue. The pain worsens at the first steps (often first steps in the morning or after periods of rest are the worst) and decreases after your foot warms up. As your condition deteriorates, the pain gets worse and finally, becomes a permanent pain. In untreated, chronic cases, there may be an accumulation of calcium within the tendon that needs much longer rehabilitation period. Compression: Often taping the plantar fascia can relieve pressure from the tenson and aid in healing. Elevate: If swollen or inflammed elevation above the level of your heart can assist in decreasing swelling. Shockwave therapy – Quickly becoming the gold standard of treatment for plantar fasciitis that does not resolve within 3 months. Studies have shown that most cases of plantar fasciitis will have significant relief of pain and symptoms for up to 1 year after the procedure. Most people require between 3-10 treatments, spaced out approximately 1 week apart. Our Chiropodist uses 3D laser scanning technology to create a highly accurate 3d mold of your foot. This allows us to build a very comfortable to orthotic insole. Custom orthotics are placed inside your shoes to provide support, absorb shock, and influence foot position. Using custom orthotics can help you reduce arch strain associated with plantar fasciitis. At Ace Physiotherapy we provide expert care to treat your plantar fasciitis. We use advanced equipment such as shockwave therapy, and laser 3d orthotics scans to help you recover as quickly as possible. For more information about Custom Orthotics or to book an appointment please call 416-900-6653 today!